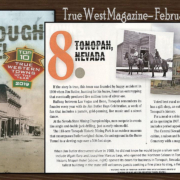 Tonopah, NV Honored as Top True Western Town by True West Magazine! The legend goes that Tonopah was founded by happy accident in 1900 when Jim Butler, hunting for his burro, found an outcropping that eventually produced five million tons of silver ore. True or not, Tonopah is a place with a rich history and heritage. That is one reason Tonopah is #8 among True West Magazine’s 2019 Top Western Towns. Tombstone, AZ took the top spot. They will be featured in the February 2019 issue, hitting newsstands on December 10, 2018. Halfway between Las Vegas and Reno, Tonopah remembers its founder every year with its Jim Butler Days Celebration, a week of fun that includes a parade, gold panning, live music and a street dance. At the Nevada State Mining Championships, men compete in events like single and double jack drilling, just as early miners did. The 113-acre Tonopah Historic Mining Park is an outdoor museum that encompasses Butler’s original claims—and it’s been voted best rural museum in Nevada five years running. 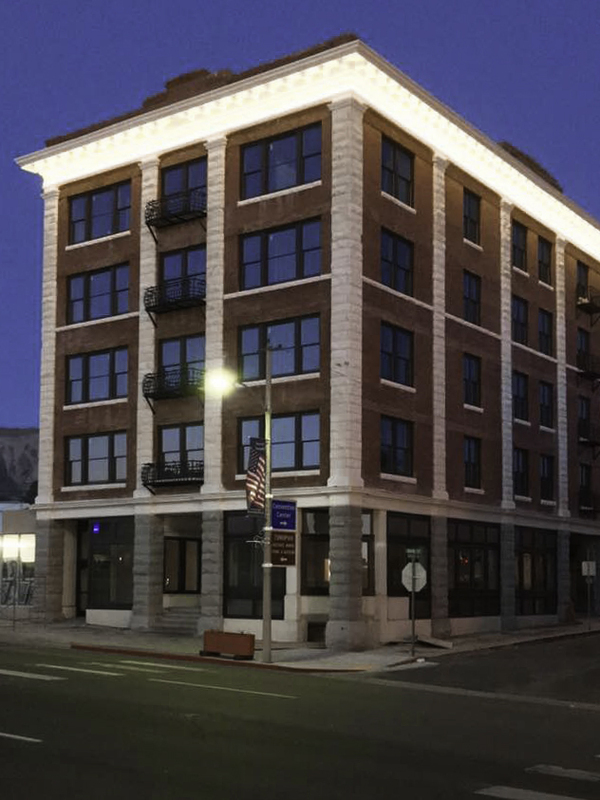 For a meal or a drink, stop at the Mizpah Hotel, the height of luxury at its opening in 1907. The Central Nevada Museum has an Old West town with miners’ cabins, a saloon and blacksmith shop. Walk through the Old Tonopah Cemetery with a map that tells about the 300 souls buried there. This is the 14th year True West has presented this annual award. Editors base their selection on criteria demonstrating how each town has preserved its history through old buildings, museums and other institutions, events, and promotions of historic resources. True West magazine is in its 67th year of leading the way in presenting the true stories of Old West adventure, history, culture and preservation. For subscriptions and more information, visit TWMag.com or call 888-687-1881.
http://www.tonopahnevada.com/wp-content/uploads/2018/12/truewest.jpg 720 1280 admin http://www.tonopahnevada.com/wp-content/uploads/2018/01/TONOPAH-LOGO-REDISH.png admin2018-12-10 20:37:182019-01-17 21:54:54Tonopah, NV Honored as Top True Western Town by True West Magazine! RENO, Nev. (Mar. 27, 2018) – In a continued effort to provide access to critical health care services for Tonopah and the surrounding area, Northern Nye County Hospital District is excited to announce two collaborations that will expand services in the area. 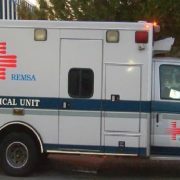 The Regional Emergency Medical Services Authority (REMSA) and Renown Health have both entered into agreements with the Northern Nye County Hospital District for a phased expansion of services over the next year. REMSA has recently launched an exclusive phone number for the Nurse Health Line for Northern Nye County residents, 775-482-3377. The free, 24/7 call-in line is staffed with registered nurses providing assessment, care recommendations and/or referrals to appropriate health care or community services. Northern Nye County residents are encouraged to call the Nurse Health Line for illnesses, injuries and symptoms including a sore throat, minor burns, arm or leg pain/injury, cough/cold/flu symptoms, falls, vomiting, rash, low fever, minor pains, sprains/strains, earaches and nosebleeds. However, people should continue to call 9-1-1 for emergencies. Future phases of the REMSA expansion will include locally-based, 24/7 Community Paramedics, as well as community wellness and public education initiatives. Renown, in partnership with the Northern Nye County Hospital District, will be expanding on the care already being provided to residents since it opened the medical group in June 2016 at the former Nye Regional Medical Center, 825 S. Main Street in Tonopah. Primary and specialty care services using telehealth technology were initially offered, with more than 1,500 appointments in the medical office last year. The medical group later expanded to include lab and x-ray, with more than 700 appointments in 2017 for these services. Medical office hours have recently expanded to 7 a.m. to 5 p.m., Monday through Friday. 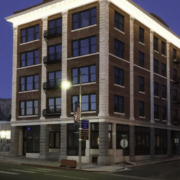 Urgent care and occupational health services have also been added to Renown’s Telehealth offering, including drug and alcohol testing, as well as treatment and follow-up after a work-related incident. Plans to expand care will include adding additional telehealth services based on the needs of the community, increasing testing and treatment capacity, and evaluation of hiring an on-site provider. These are in addition to the quarterly visits by a doctor already available.